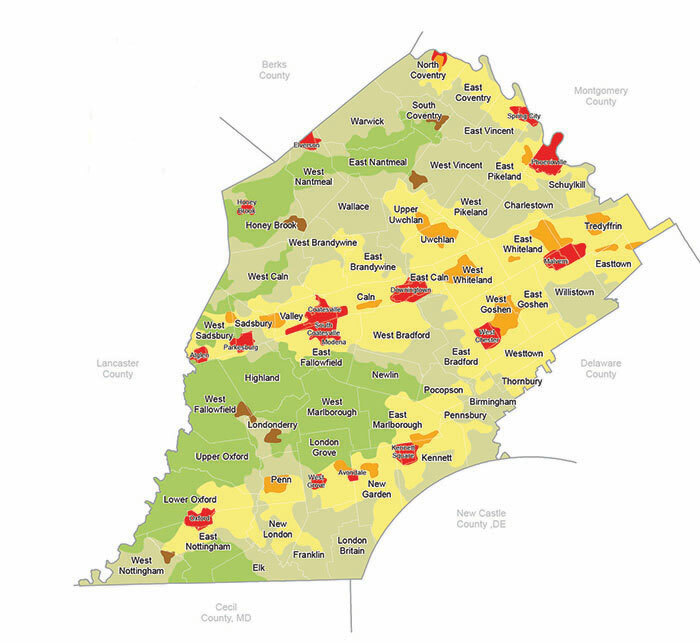 The Landscapes Map is Chester County's guide for growth and rural resource protection to help achieve our vision. The map's six categories — four in the Growth Areas and two in the Rural Resource Areas — guide future growth while protecting the special characteristics of the county. Each landscape may be appropriate for multiple land uses, with the mix and intensity varying to reflect the character of the specific landscape. The Landscapes Map also recognizes significant historic and natural resources through map "overlays". The four landscape categories of the Growth Areas can best accommodate future growth, are planned for a full range of infrastructure, and are highly suitable for redevelopment. The two landscape categories of the Rural Resource Areas are not appropriate for significant growth, strongly reflect the agricultural and rural character of the county, and serve as a focus for preservation efforts. View interactive version of the Landscapes map.